Nobody believes him. And nobody should, given Anson’s violent past and rocky relationship with his dead wife. Everyone wants to see Anson convicted. Except Eddie McCloskey, paranormal investigator turned expert witness. Only Eddie can prove the man’s innocence, but in doing so, can he find the real killer? The Accused and the Damned is the first of its kind, a paranormal legal thriller and it is the third in The Unearthed series. This is the third book in The Unearthed series and I am still very much obsessed! 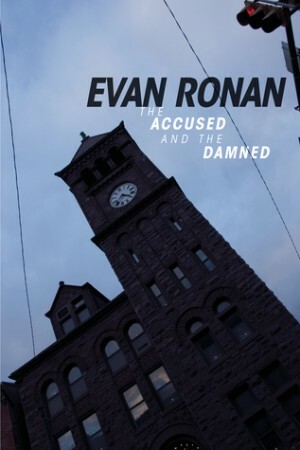 Evan Ronan has done another great job at amazing me with this Paranormal legal thriller. The Accused and The Damned is the first of it's kind – that's probably why I never heard of a paranormal legal thriller before this. I was skeptical at first because I don't usually find the legal system entertaining. However, that courtroom scene may have won me over because that was exciting. I was hooked to it with wide eyes and an open jaw by then end of it. That was more surprising to me than all the plot twists dwelling in this book. The paranormal aspect is still there, it wasn't as strong as with the first two though. At first I didn't like that, I didn't want to know about all the police stuff. I just wanted to know about Eddie but once the ending came I better understood why it was all important. It's weird to think of a character maturing but that is exactly what Eddie is doing. Before my eyes he has become a grown man trying to make a living like everyone else – just in a job field that most people don't believe in. The old Eddie still poked through the new more mature exterior making him a very interesting lead character. With every book I fall more and more in love with Eddie – I'm going to be a mess when this series comes to an end. I didn't think I was going to like Gracie at first because I thought she was going to be trouble for Eddie – And I can't stand for that. But she ended up being quite the opposite. They became allies and lets face it Eddie's career wouldn't have been able to stand a chance if she was his enemy. Giles was finally introduced after he was mentioned in the first two books, I knew it was going to happen. He was not what I expected him to be, I got creeped out by him from the get go. I think for the first time ever I figured something out that was not yet said in the book. I was proud of myself, then the ending came and I was shocked because that was not what I thought was going to happen. I think I finally managed to pick my jaw up from the floor. The Accused and The Damned ended in a way that made told me there is going to be another book. I am so thrilled and I can't wait to read it.